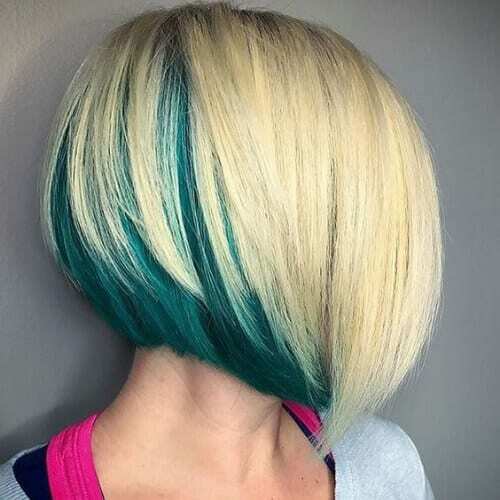 The stacked bob haircut saw its heyday back at the beginning of the 2000s when everyone who was someone or, at least, aspiring to have a sense of style was wearing one. Since then, it has dwindled down a bit, and it has been included in the ‘mom bob’ category. 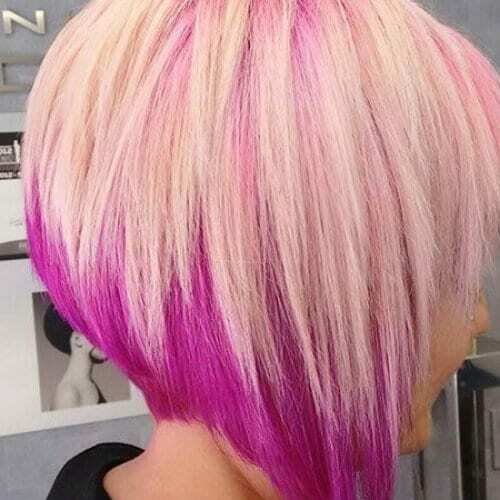 However, the end of the 2010s has seen a rebirth of the stacked bob. So, one question arises. How do we make it modern and cool? Here are 50 ideas to inspire you. If the beginning of the 2000s were all about keeping your hair sleek and of fleek, then the end of the 2010s are all about messy hair and the ‘I woke up like this’ look. 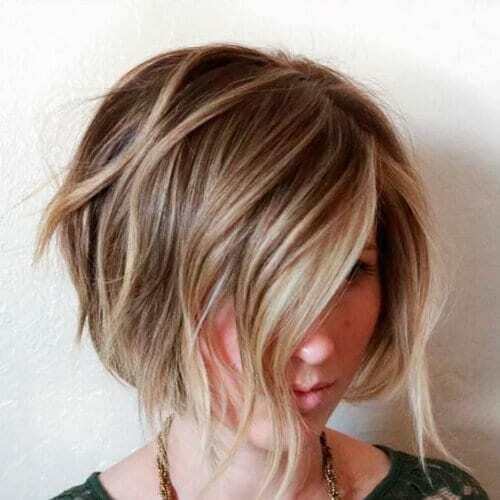 Give your stacked bob a chance to look casual and messy. Building on the idea of the ‘I woke up like this’ look, this is what the bed head stacked bob looks like. It’s an effortless style to pull off. All you need is a bit of hair mousse. Run your fingers through your hair to get the desired result. 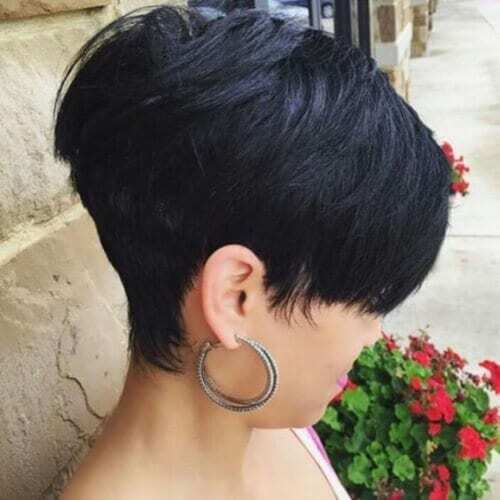 This version of the stacked bob is closer to what women used to wear back in the 2000s. The secret is a healthy dose of glossing agent such as hair oil or spray. 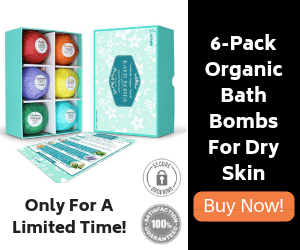 You can use organic argan oil or even olive oil if you want. This lovely bob was treated to an amazing copper balayage that shines in the sun like molten gold. 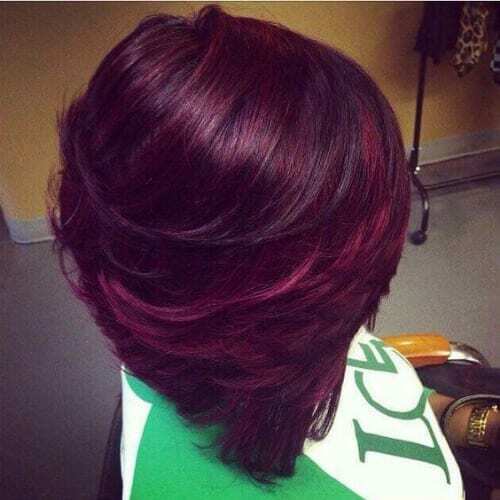 Mix it with some chestnut brown for the underlying color or your natural hair color if you prefer it that way. 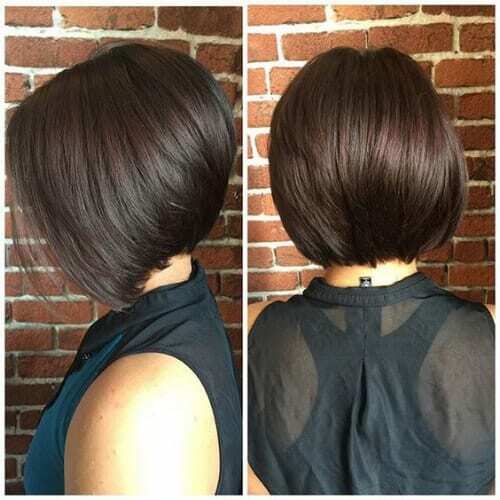 This is a nape-length stacked bob that has been rounded in the back to give it a more elegant appearance. The hair itself is very straight and sleek with a dark undertone but a very light and frothy blonde on top. 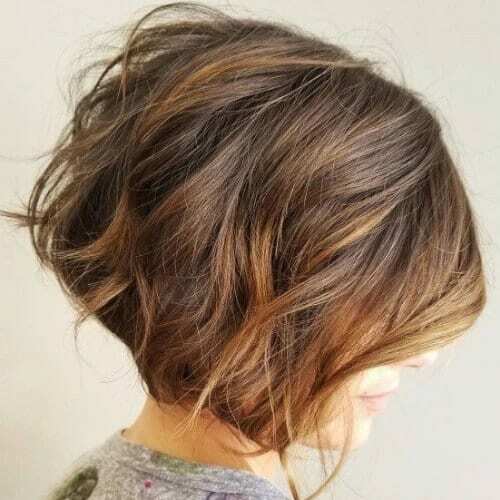 This is a version of the stacked bob that many stylists actually advise you to be very careful about. 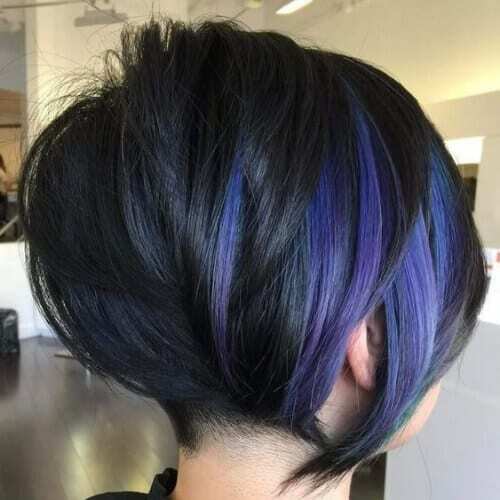 When you go and ask for the stacked bob, a lesser hairstylist will give you a cookie cutter hairdo that might not compliment you that well. 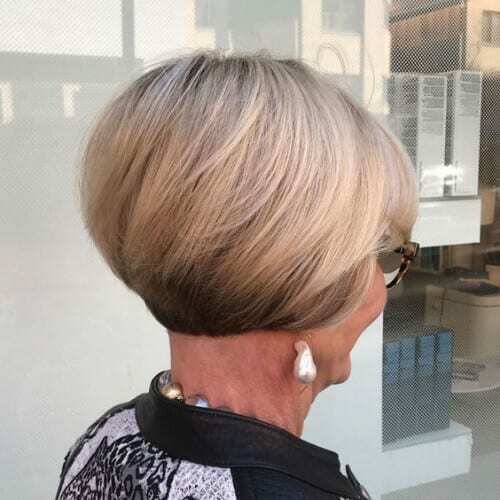 The reason why the stacked bob also bears the name of an asymmetrical bob is obvious. The haircut must have a longer front which ends in a set of long, twin strands and a short and layered back. They form a triangle. This is how a short, stacked bob looks like after you have used your hair curler on it a bit. It will help you add some extra volume. Plus, when it’s wavy, you can see the layers a lot better than when it’s straight. 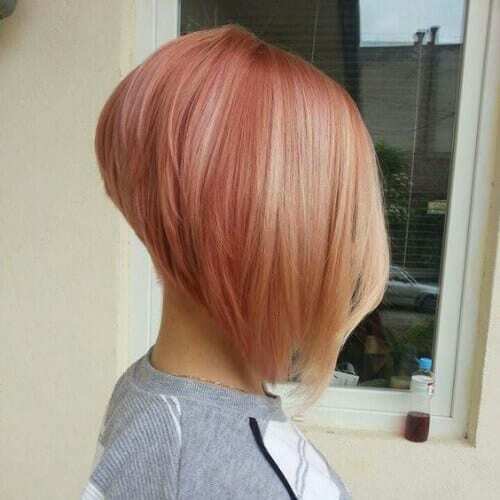 There’s a fine line between a pixie cut and a bob. 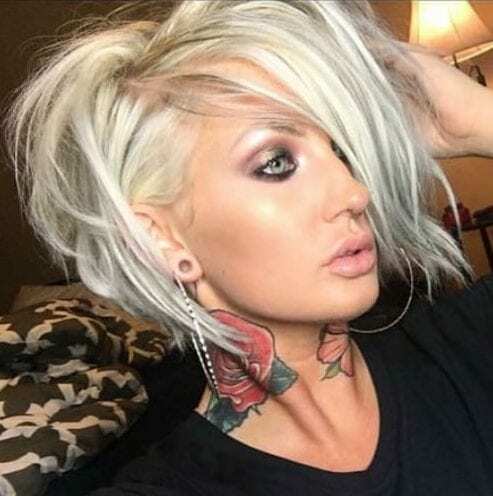 Therefore, you need to be very careful what you tell your hairstylist and, more importantly, how much of your hair he or she ends up cutting off. There was a time in Victoria Beckham’s life back in the 2000s when she looked like this. Granted, it might not have been one of her best looks, but she tried to make the super short, bottle blonde bob work. 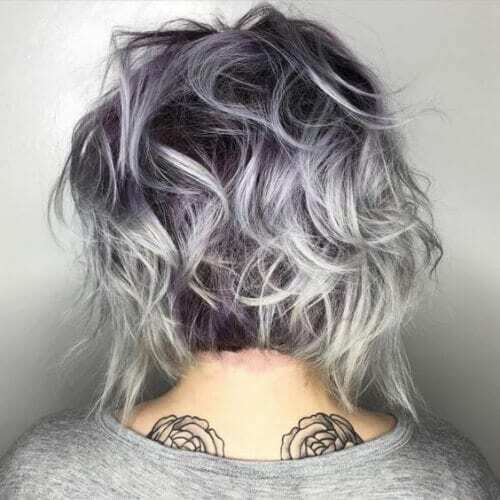 This is a silver stacked bob with just a hint of purple. 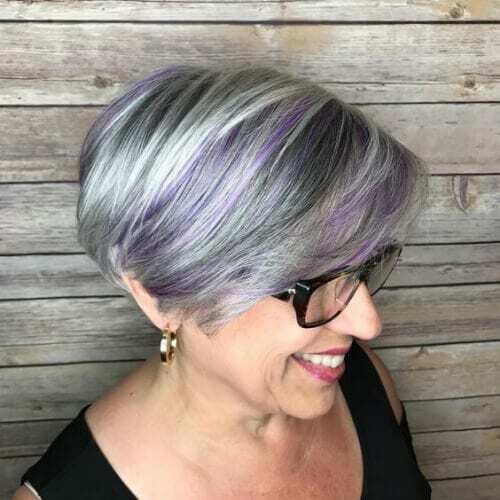 You can keep your natural graying hair if you want and are proud of it or you can dye it to look like this. 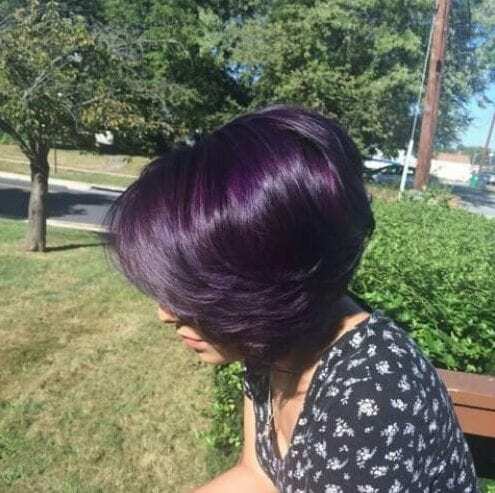 Either way, the pop of purple color will help bring it out. 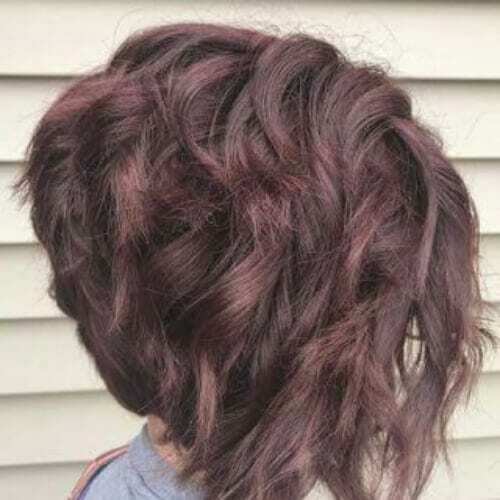 Speaking of natural hair colors, here’s another one that you can either keep if you happened to come by it organically or get it out of a bottle if you fell in love with it. This is chestnut, a deep and rich shade of brown. 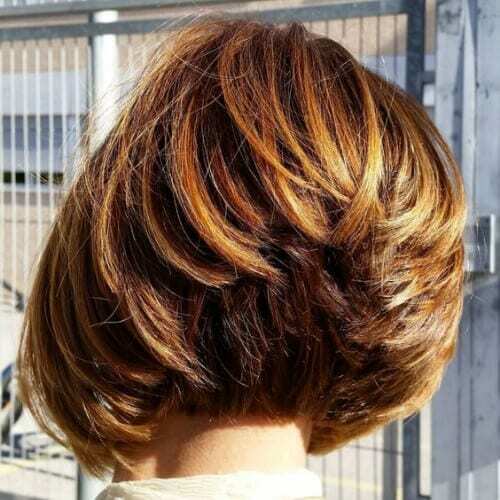 This is a jaw-length, tousled bob in a natural brown hair color with a few copper highlights, which make it the perfect haircut for fall. Just think about it. It won’t get caught in your scarf, and it looks like the falling leaves! 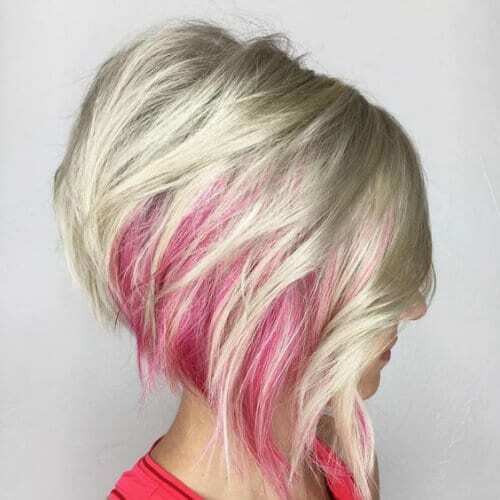 This extra short bob is everything you could ask for on a hot, summer’s day. It will free your nape and neck from the sweltering heat. Plus, it looks really cool matched with those big hoop earrings. 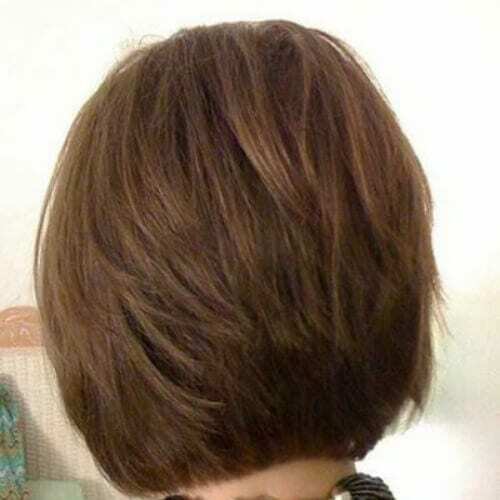 Here’s a comprehensive view of what a bob haircut looks like from behind. You can clearly see the straight line it forms that cuts clear across your neck as well as all the layers going up that gives it its bounce and mobility. 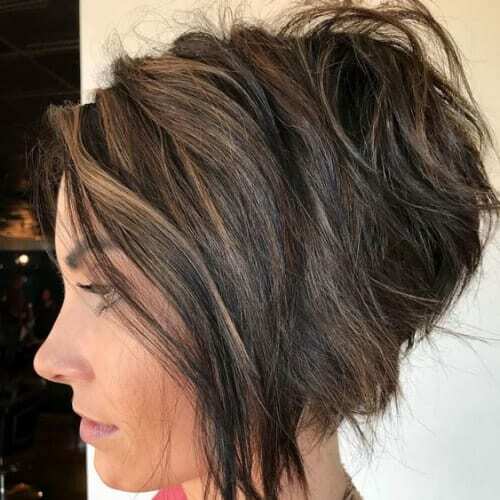 A stacked bob is typically a good idea for curly hair as long as the stylist takes into account your facial features and personalizes the haircut instead of giving you a by the numbers cut. Make sure this hairdo suits you before you get it. 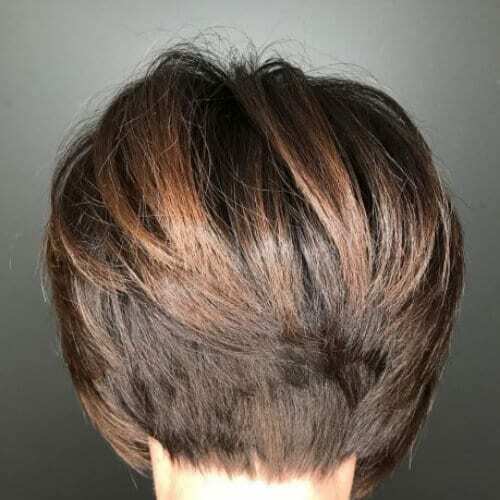 When you get this type of highlights, they will distract the attention away from the layers in the back and instead focus it on the asymmetrical and thin strands that you have going on on the sides of your head. If you want to dye your hair a non-conventional color but are too afraid of a big change, why not try something muted and non-committal? This is a dusty and dark purple that will highlight your eyes if they are blue. One easy way of bringing the stacked bob into the 2010s is by getting an undercut or an undershave. 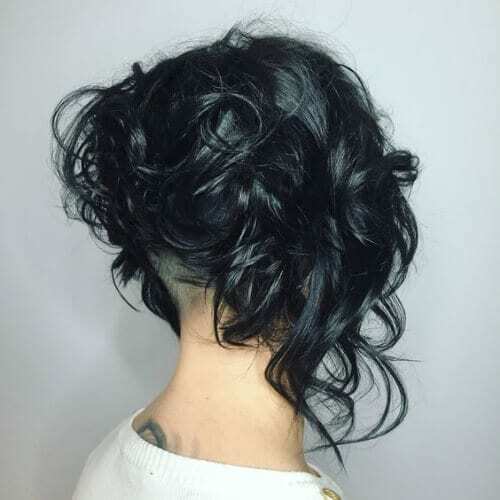 Get it right at the nape of your neck, below the layers and in between the two asymmetrical strands on the sides. 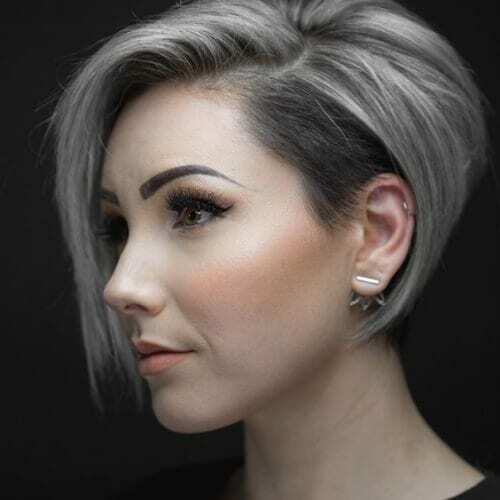 Another way in which you can modernize this 2000s haircut is by getting the aforementioned undercut and then having something designed into it. You can go for a geometric or flower design such as this one. 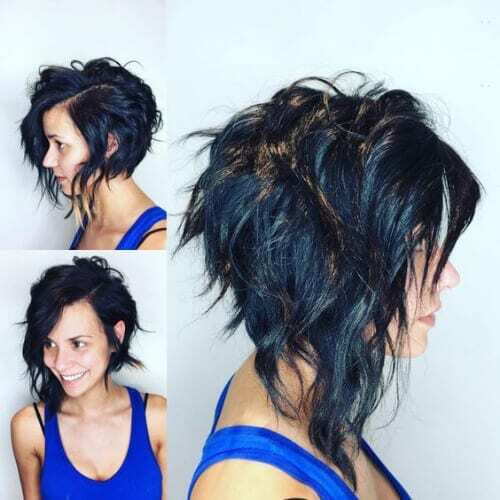 This is an edgy and angled, asymmetrical, razor cut stacked bob with a wavy texture. The color is a raven brunette to which some glossing agent has been applied to make it silky and shiny. The longest tips have been dipped in blonde. 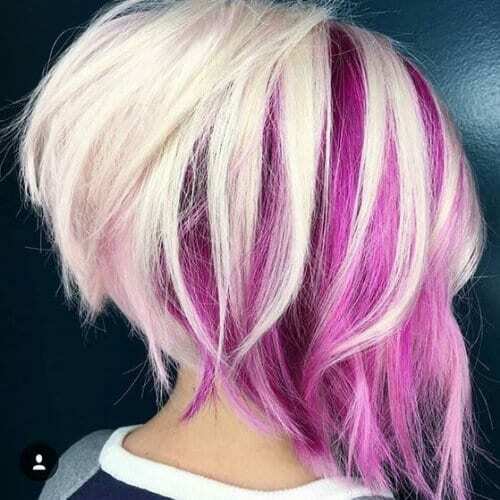 If you’re looking for a unique hair color, you’ve just found it. 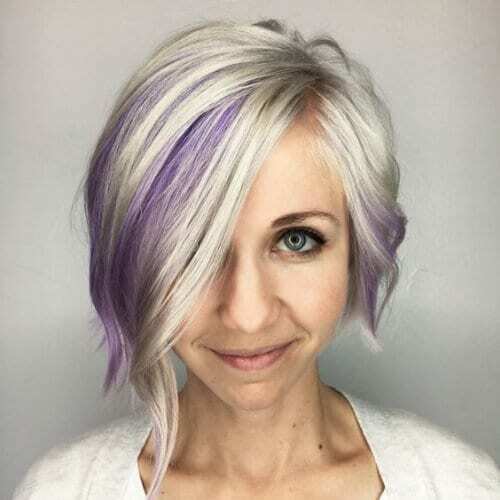 This is purple-gray in the shape of a very asymmetrical, stacked bob with a textured and messy finish. You will need a lot of hair product to style this one, such as hair wax or mousse. Singer and self-proclaimed ‘bad girl’ Rihanna went through a lot of hairstyles in her career, one of them being an ultra-short stacked bob which allowed her to flaunt her beautiful and impeccable natural curls. As you well may have noticed from this piece, the platinum or silver plus purple combination is a very popular one right now. Therefore, we suggest you hop on this trend as soon as possible and take some Insta pictures before this trend expires. 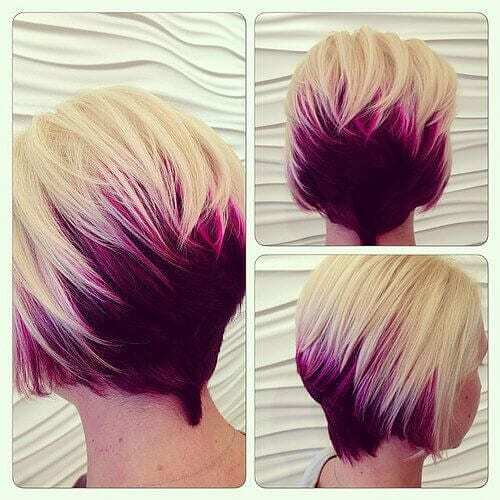 Peekaboo highlights are a wonderful way to update any hairstyle and hair color for that matter. 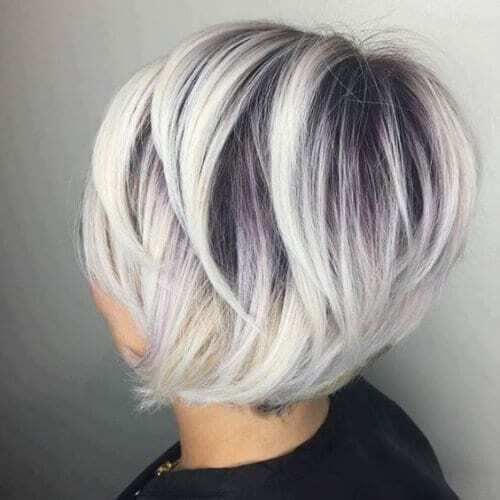 If you’re a little tired or bored with your platinum hair, why not add a handful of peekaboos, and watch that stacked bob haircut spring to life? As far as peekaboo highlights go, you can also choose other combinations, that better suit your needs. 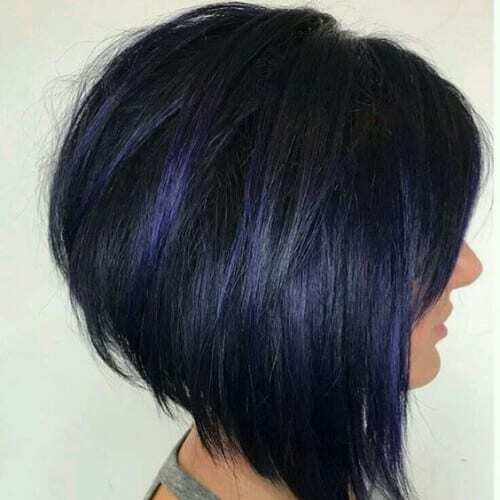 This is classic brunette hair with matte indigo highlights that accentuate all the lines of your haircut as well as all the layers. This hairstyle’s name becomes obvious once you take a good look at it. It’s called ice and fuchsia because it’s a combination of ice blonde and fuchsia pink underlights. We especially love how the two colors highlight each other. Here’s another interesting combination, this time between pine green and bottle blonde. Undoubtedly, it’s a bold one, but once you get it, you won’t regret it. This can easily be your go-to hair color for the winter. Opal hair is not easy to get, but it’s definitely worth all the effort. 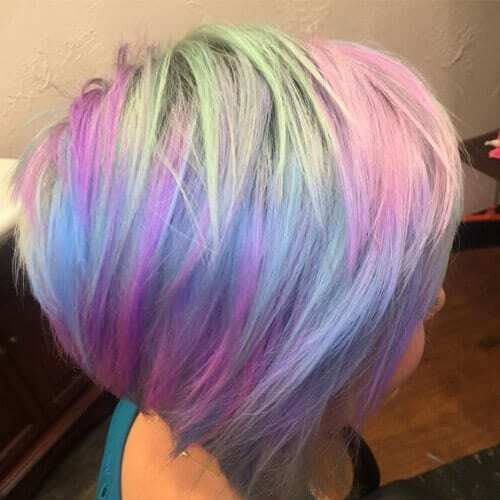 In fact, we suggest you leave this one to the professional hands of your stylist and not attempt to combine all the colors at home. Speaking of dying your hair at home, here’s a tip. Orchid is not a shade of pink. In fact, it’s a shade of purple. This nugget of info might prove itself useful when you’re mixing dyes to get the right shade. Headbands have always been a fantastic way to accessorize but also to separate your hair and your bangs. It creates definition and adds a bit of easy glamour to what would otherwise be a mundane hairstyle. Opera mauve is another amazing shade belonging to the extensive purple family. 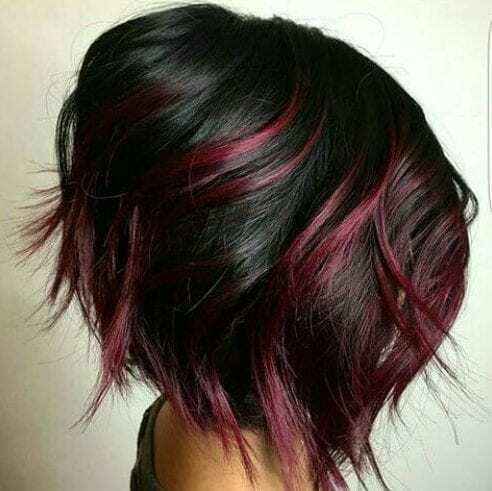 This one is theatrical and rich, giving your haircut a dramatic effect, that will shine in the summer sun when we recommend you wear this color. Are you ready for some more purple? This time it is iris that has won over our hearts with its cold and powdery qualities as well as this wonderful matte finish. Tip – wear it with a pinup inspired makeup that comprises scarlet lipstick and cat eyeliner. One of the main trends this year, as you may have well noticed, has been extreme blondes. This means arctic, iceberg, milk, platinum, silver, and white. 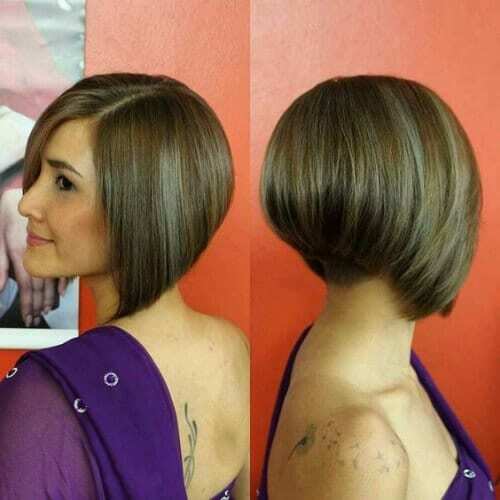 You can see the latter in this example of a stacked bob haircut. Deep blue and glossy highlights on dark brunette hair have the unique quality of upgrading it without changing it too much. You can only notice the highlights in direct sunlight and when the hair is in motion. 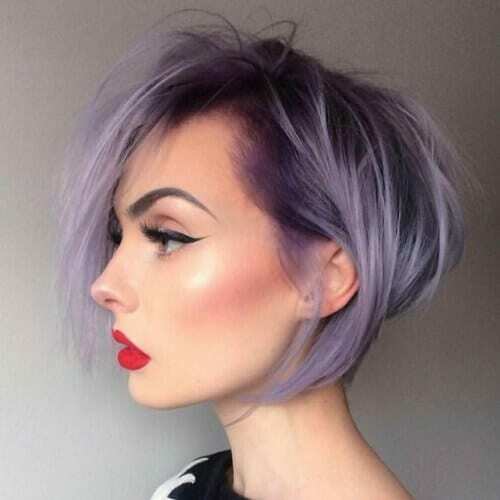 There really seems to be no shortage of purple shades when it comes to hair colors. This is the forever fascinating amethyst that looks like your hair has borrowed its color from a precious gem. We’ve mentioned above iceberg blonde as part of the extreme color trend that’s been going around this year. Now it’s time to see what it looks like. The great thing about it is that you can pair it with any kind of makeup you want. 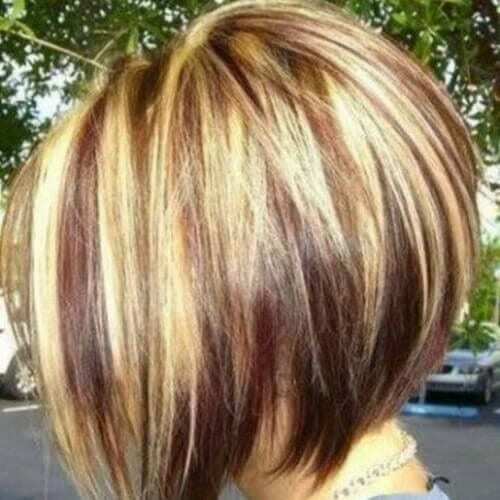 As we stated previously, the stacked bob had a big moment in the spotlight back in the 2000s. This is an actual picture from back then so that you can have a frame of reference between the original and modern versions of this haircut. There are no limits when it comes to the side strands of this hairstyle. This means that you decide how long or short they are. 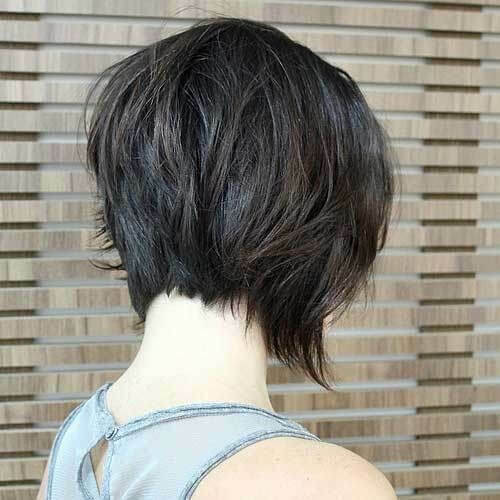 The only rule of the stacked bob is that it has a shorter and layered nape. Before it was replaced by copper and brass as the new trends which are part of the metallic hype, there was rose gold and rose blonde. This is what it looked like, and ladies everywhere went nuts for it. This combination is only for the brave because it asks you to mix two opposing colors – black and red. However, if you style it correctly, they will highlight each other instead of canceling each other out. The perfect Instagram picture is only one haircut away. How well does that sound? All you need to do is show your stylist this cute picture, and you’ll have more followers than you have dreamed of in no time. There’s red hair, and then there are sophisticated red hair colors. We advise you to go for the latter. This, for example, is red raspberry, a scrumptious and rusty red in which you can almost see the forest fruit. The same goes for this shade of red and purple which is called mulberry wine. It’s a deep crimson red with just the right number of purple highlights streaked through it. The result looks almost like the frosting of a cake! Even if you don’t want to combine your red hair color with anything and prefer to keep it pure, you can still go for the sophisticated look. This is ruby red, a deep and silky shade of red that will highlight your eyes no matter what color they are. 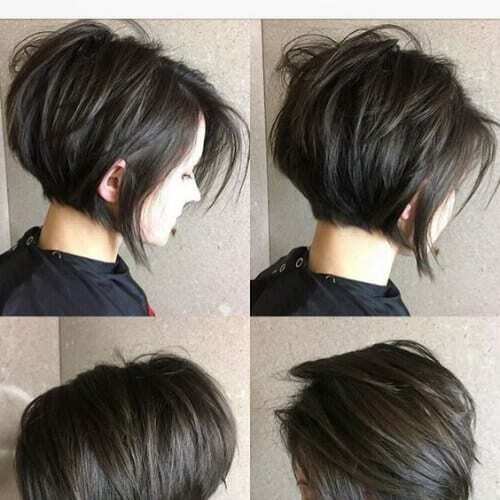 As we mentioned in the beginning, at some point in its long history, the stacked bob was included in the ‘mom haircut’ category. However, this doesn’t mean that you have to keep it straight and boring. Get creative! Blowing up your hair hasn’t been a major trend for quite a while now. Still, you can try it if you have the perfect face shape for it or if you need to add a few inches to your height, and high heels just won’t do the trick. 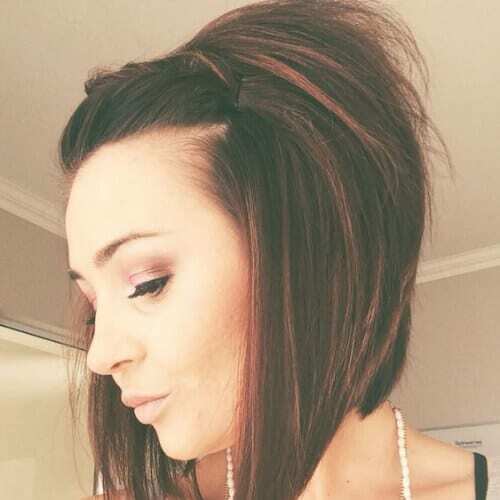 You can even try a half up half down hairstyle when you have a stacked bob. Tease the back into a beehive to give it some extra body. Use a handful of bobby pins instead of a scrunchie to make it look more elegant and grownup. If you don’t want to go the traditional ‘triangle’ way, which means short, layered back and two strands of hair curtaining the sides of your face, then you can opt for a set of long bangs with a side sweep. 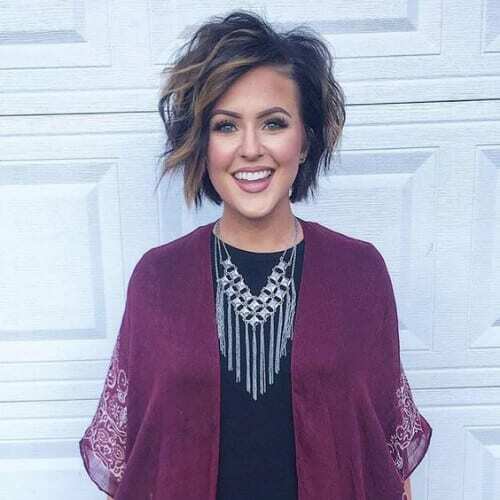 The beauty of the stacked bob is that, when you are attending a formal function or event, all you need to do to style it and make it high-class is to straighten it. It’s a really low maintenance haircut that will not take much of your time. 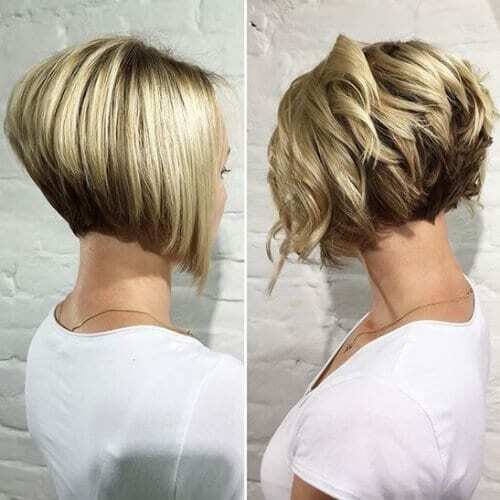 The stacked bob haircut is also called a layered or a graduated bob because the layers at the back add a lot of volume to your mane. Whether you get an extra short one, a long and feathery bob or a stylish one with bangs, you have hit the styling jackpot. Let us know in the comment section below which one of these ideas was your favorite!